I’ve never had any real ties to Texas, but growing up we had a monster-sized screwdriver in the house that was longer than I was tall. I asked my dad what it was for and he told me it was a “Texas screwdriver.” Not too long afterwards I suspected that I had been the victim of his never-ending sense of humor, or was I? After speaking with Rick Fairless, owner of Strokers Dallas, I realized that the phrase “everything’s bigger in Texas” held its merit beyond a promotional phrase or my father’s quick-witted humor. 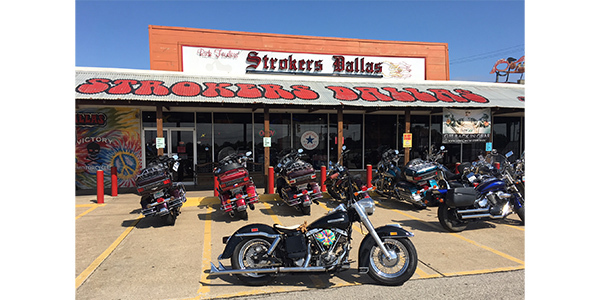 In 1996 when Rick Fairless opened Strokers Dallas Custom Motorcycle Shop, business grew fast, allowing him to follow it up with Strokers Ice House Bar and Grill and, eventually, RF Custom Parts, Fearless Services Insurance and Big State Fountain Grill. There’s a good chance that Fairless doesn’t need an introduction. If you didn’t know him already by his undeniable passion for motorcycles and contributions to the industry, you may recognize him from his column “Can Ya Dig It?” which he has been writing for MPN since 2016. Strokers Dallas first opened with five employees, and since the internet was not widely used at the time, Fairless relied on the Yellow Pages to get the word out about his shop. He knew that if he got people through the door, he could find a way to make Strokers Dallas their go-to bike shop. Fairless was already well known around the Dallas-Fort Worth area as a custom bike guy, which brought a lot of custom bikes to his shop for service. Early on, his dealership sold Titan, Big Dog and American IronHorse motorcycles, and they have always sold used bikes, focusing on Harley-Davidson or any American-made bikes that measured up to their standards. By getting to know his customers, Fairless realized that the same people who might only come into his shop a few times a year were visiting a bar and grill every couple of weeks. Giving him an idea, he opened Strokers Ice House Bar & Grill right next door to Strokers Dallas, creating a true destination for not only his customers but also potential customers-to-be. Strokers Ice House was built as a draw for the motorcycle shop, but Fairless created it to be eclectic and different from any others out there. Following the demands of the market and seeing an opportunity, Fairless opened RF Custom Parts about 10 years ago, building custom parts for Victory motorcycles. After the demise of Victory, their focus has shifted to Harley-Davidson, and they work continuously to develop new products that offer the function and style that RF Custom Parts are known for. Seeing yet another opportunity to boost his business, Fairless began selling insurance specifically to facilitate motorcycle sales. No longer does a customer have to wait to buy a bike when they can’t get ahold of their insurance agent; it’s all taken care of in house by Fearless Services Insurance. Selling motorcycle insurance proved successful, and Fairless expanded FSI into a full-line insurance company, offering homeowners, auto, motorcycle and renters insurance, and has plans to expand into business insurance later in the year. Currently with 25 employees, Strokers Dallas sells motorcycles, trailers, parts, merchandise, insurance and apparel and has a service department that does it all, including the custom work, and it’s the custom motorcycles that are Fairless’s favorite part and also what has given the business its identity. Strokers builds about eight to 10 full, ground-up custom bikes each year and customizes several hundred, most of which are Harley’s. Fairless does most of the initial custom bike design work, then consults with his builders, service and parts managers, and notes that it’s always a team effort with his crew. Some of the coolest and radical designs you’ll see are a testament to Fairless’s creativity, and wildly beautiful paint adorns every square inch of his bikes. For 23 years, Strokers Dallas has used “Other Side Customs,” owned by Gary Queen to lay down the pigmented perfection that gives each custom motorcycle its final personality. When talking about his successes, Fairless mentioned that Strokers Ice House is the best marketing tool he has ever had for Strokers Dallas. Fairless and his wife Sue also own Big State Fountain Grill in Irving. An old-fashioned diner, it is important to them to keep the history of Irving alive and employ Irving residents. “We are giving back to the city that we were born and raised in and where we still live,” Fairless added. Success starts with great ideas, but that doesn’t mean it comes easy. The two main ingredients in Fairless’s formula have been hard work and passion. “The business has changed so much over the last 23 years and it’s not for the better,” Fairless said. “The Baby Boomers are aging and many are not riding or they have passed on to the other side, and young people are not as passionate about motorcycles as we were when we were young. Strokers Dallas is no stranger to charity and supports the Texas Scottish Rite Hospital for Children along with many more including the Kyle Petty Charity Ride, building a custom Strider bike for the Flying Piston charity breakfast at Sturgis and being a member of the Hamsters USA, just to name a few. In addition to being involved in charity, Fairless still finds the time to just hang out and talk to his customers. Treating people right, hard work and passion are the driving force for this Dallas custom motorcycle destination, and Fairless has capitalized on the opportunity to make his home state proud and prove that everything is bigger in Texas.